Before even thinking about valuing stocks using discounted cash flows, first see how this method fits into the possible investing strategies discussed on the Big Picture Strategy page. This methodology for valuing projects is very powerful. It has three basic inputs; the cash flow dollars, the timing of those cash flows and the rate of return demanded. But there are more than a few problems when trying to use it for valuing stocks. The model presumes receipt of, and benefit from, all the cash flows by the investor himself. That will be true of the stock's purchase and sale price and its dividends. But what about companies which pay no (or small) dividends? Then the eventual sale price becomes the dominant factor in the stock's valuation. When the current value is derived from the future resale price, any assumptions about the valuation at the later date self-justify the current value. If the current value depends on discounted cash flows, then that future sale price will also depend on discounted cash flows. So any analysis would have to go far into the future, until the discount rate makes those cash flows immaterial. That analysis is never done, with any valuation methods using cash flows. The model has no inputs for dilutions of ownership percentages. It is never calculated on a 'per-share' basis. When shares are issued and bought-back, or when options are used for compensation, the stock owner's percentage ownership of the whole changes. The model has no inputs for non-cash barter transactions, e.g. DRIPs, or shares issued for goodwill or as employment compensation, or dividends not paid in exchange for debt release, etc. As this methodology has gained popularity, so too management has finessed analysts by hiding the company's problems in these ignored transactions. There remains the huge problem of defining exactly "what" cash flow. For a directly owned project, all cash generated is under the control of owners and available to them (the total changes in cash = the first column of the diagram below). But shareholders have no control over a company's cash - either the total change in cash or possibly some subset, of a subset, of a subset, of that total (working your way to the right of the diagram). What definition of 'cash' should be considered 'as if' under the control of shareholders? An old valuation model using discounted cash flows is the Discounted Dividend model (the Gordon Growth formula). The formula is derived mathematically by summing the present value (discounted value) of each future year's dividend. But is it really a discounted cash flow model? No. It misses the point. The idea behind calculating the Net Present Value of cash flows requires an active estimate of each future cash flow - its size and timing. In contrast, the discounted dividend models simply assumes the cash flows to be equal (adjusted for growth) forever. At best, an allowance is made for one change (possibly two) in the future. What is being accomplished by the calculation is not 'discounting cash flows'. The model effectively 'capitalizes' the yield. There is a qualitative difference between the two systems. E.g. you find a perpetual preferred share's value by 'capitalizing' its income - by dividing the dividend $$ by your required return. E.g. you capitalize real estate's profits by dividing the operating cash flow by your required Cap Rate. E.g. you find a stock's value by capitalizing its earnings - dividing earnings by your required earnings yield (using P/E metrics). The Gordon equation finds the security's value necessary to make the sum of the dividend yield plus growth equal the investor's required rate of return. The equation can be derived without any discounting at all. It 'capitalizes' the dividends. There is a second valuation method often labeled as 'discounted cash flows', that is again just a 'capitalizing' model. Instead of capitalizing dividends or earnings, it capitalizes some defined measure of 'cash flow'. Cash flow is multiplied by some desired multiple to determine a security's value. This is what happens when you hear the 'experts' saying "It is trading at just 4 times cash flow." This multiple of cashflow (P/C) is equivalent to the P/E multiple. The multiple is just (1 divided by a desired discount rate). There are many problems. No matter what measure of cash flow you use, the flow varies widely year by year. Yet when you capitalize a particular year's cash flow you are presuming it is 'normal' and will continue forever (with presumed growth). No matter what ACTUAL cash flow you measure, it will always need adjustments before it can be considered 'normal'. A lot of those adjustments effectively recreate accrual accounting ...... which has done a better job already (as argued on the Cash Truths page. Poor cash flow (however measured) in one year may well be because great things are happening. Expansion opportunities require investment. Rapidly expanding businesses often have trouble keeping solvent. But capitalizing cash flow would value the company lower, not higher. Price/Cash quotes, (eg) 4 times cash, or 8 times cash, are meaningless numbers. Is 8 good or bad. 4 seems much cheaper but is it so cheap as to raise red flags? Why are Oil and Gas companies considered appropriately valued at 5 time cash flow, while Industrials are valued at 15 times cash flow? Most of us are familiar with P/E multiples. We know the historical averages and extremes. We know what values are appropriate for different industries or growth rates. But none of that is true for P/C. Should we consider the P/C in comparison to the P/E? Is 'half-the-PE' appropriate? What are we supposed to DO with the number? How do you evaluate the company with a high P/C only because it has chosen to (eg) lease equipment instead of buying it? 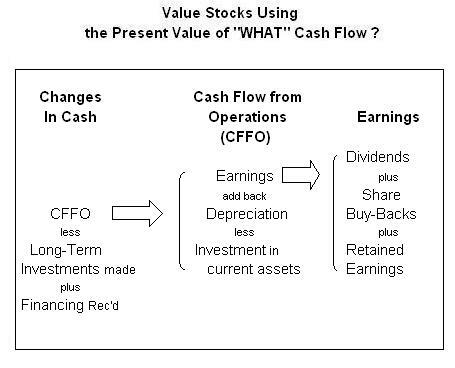 The cash flow $$ used must be defined somehow that makes sense. Arguments can be made for and against the inclusion of most all the sets and sub-set of cash shown in the diagram above. Free Cash Flow (FCF) sounds as if it is the metric to use, but how exactly is it defined? You cannot see it in the diagram above. Its failings are discussed on the Cash Truths That Aren't page. The true discounted cash flow (DCF) model is necessarily made of two parts. For the first period of years the company's cash payments and receipts are modeled year by year, line item by line item. The yearly net cash is discounted back to the present. After that a steady sustainable rate of growth is presumed for the long run. The stock's presumed value at that time, using simple P/E metrics usually, is also discounted back to the present. One model is presented by Aswath Damodaran on this spreadsheet. For each year of the foreseeable future the expected net cash increase/decrease is calculated. It reflects the left column in the diagram above. Each year's change in cash is discounted back to the present as if it were paid as a dividend. The value of the stock at the end of the foreseeable phase is derived using the more basic P/E or Discounted Dividend models. This is also discounted to the present. So the DCF valuation method still has the problem of deriving a valuation for the company that ignores cash flows. It really only delays the problem of valuation. A huge amount of work is involved in modeling the first period, but that level of exactitude is destroyed by the generalizations involve in the valuation at the end of that period. Increases to Working Capital are necessary for growth, even if the growth is due only to inflation. It is most common to see the current quarter/year's change in current assets used as if it is a 'normalized' value. In fact there are large swings from quarter to quarter, year to year, even though over the longer term the funding level is stable for a given level of sales. Don't include in your analysis of working capital: cash, the current portion of long-term-debt and bank debt. It is cash you are trying to measure and the debt is handled separately. Net Financing Received equals the net excess of new debt proceeds over any repayments. Companies most often keep their debt-to-equity ratios stable, so growth is financed by a combination of retained earnings and net new debt. Too often investors subtract the required debt repayments from CFFO in their calculation of FCF, ignoring new debt. This ignores the reality that company's debt balance is rarely reduced. It is replaced. With operating growth, debt will probably grow too. Remember to add the higher interest payments that result from additional debt in the year-by-year cash flow modeled. Damodaran reduces his CashFlow by the cost of long-life assets (showing in the left column of the diagram above as Long-Term Investments). Notice how his estimates are LARGER than the depreciation booked. You will almost never see an analyst making that assumption. Companies also grow by paying for Goodwill and Intangible assets. You could argue that these expenses should be included in the cost of new fixed assets. But in reality most often these are paid for by issuing additional share capital of the company. There is no cash flow. Since the model does not reflect any changes to the percentage ownership of a share, it seem appropriate to ignore both these sides of the transaction. Depreciation and amortization are correctly added back to Net Income in everyone's calculation of cash flows. Their economic reality is replaced by the asset's cash costs. While discounted cash flow analysis is an excellent methodology for evaluating projects over which you have complete control, for valuing common stock it is full of problems. What measure of cash flow do you use: Earnings, Dividends, CFFO or Free Cash Flow? How is growth integrated? Retail investors must appreciate that correct DCF modeling involves a lot of time and industry knowledge, which they probably do not have. Maybe using the traditional valuation metrics are not a bad idea.